Contemporary womenswear designer Rose Danford-Phillips creates painterly garments and accessories for distinctive women who have an appreciation of luxury with an air of eccentricity. Rose Danford-Phillips’ work takes inspiration from the exuberance of Old Masters, maximalist excess and painterly colour refined through digital transformations and multi-layered collages. She uses classic tailoring and sleek jersey to produce strikingly modern garments which remix historical styles and abstract expressionism: modern Baroque. London-born Rose Danford-Phillips graduated from the Royal College of Art in 2017 with a fashion MA after completing a BA in textiles at Chelsea College of Art & Design. 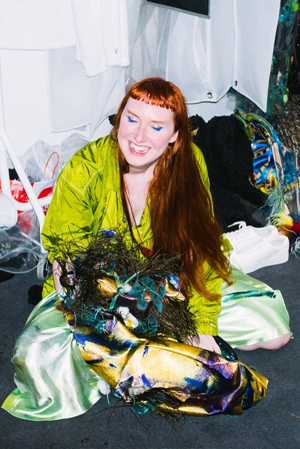 Following her Masters, she joined the MOAM Collective - a creative enterprise in Amsterdam including mentorship by Viktor and Rolf, Stephen Jones and Walter Van Beirendonck amongst others - where she and 4 other recent fashion graduates created a collaborative couture collection. She is showing her eponymous label’s debut collection at the BFC London Showrooms in February 2019, as part of the House of Peroni.